The Oregon Nurses Association is accredited by the American Nurses Credentialing Center (ANCC) as an Approver of Continuing Education (CE) for nurses. As such, we can approve CE for groups, or organizations, providing continuing education activities to nurses. ONA’s OCEAN CE Approval Unit is accepting applications from other groups and organizations who are looking to have CE awarded to learners at their continuing education activities. The ONA Approver Unit (AU) is responsible for coordinating all aspects of the peer review approval process of continuing nursing education activities as established by ANCC. 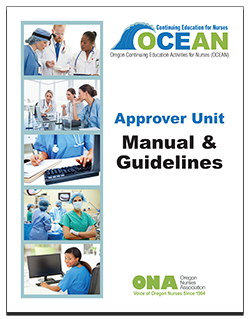 To learn more about the criteria for approval, the application process and more, please review the OCEAN Approver Unit Manual. Application fees are based on CE credits being awarded and must accompany the complete application. There is no fee for completing the Eligibility Verification Form. For more information, you can view/download the full OCEAN Approver Unit fee schedule linked below. The first step in the application process is to complete and submit the eligibility verification form. You must download the version of the form you prefer and remember to save any information you type into the form on your computer. Completed forms should be emailed to OCEAN@oregonRN.org. As you complete your Eligibility Verification Form, you may be required to complete the Commercial Interest Addendum below. Please use the forms below if applicable. Once eligibility has been granted by OCEAN, the full application packet will be emailed to the applicant. Please allow 6-8 weeks’ time to process your complete application. Please plan accordingly so that your application, and accompanying fees, arrives in our office at least 6-8 weeks prior to your individual education activity. CE cannot be awarded after an individual education activity has already taken place. You can use the following documents as resources, examples or templates for the necessary materials when submitting an application. Oregon Nurses Association is accredited as an approver of continuing nursing education by the American Nurses Credentialing Center's Commission on Accreditation. If you have questions, please contact us at OCEAN@oregonRN.org.